The night we arrived, we were lost in the Souks of the Medina in Marrakech. I mean, literally. Juliet and I left our lovely riad to wander the narrow streets and alleys of the bustling old city. We enjoyed a tasty French-Moroccan meal and then set out for our temporary home. After two hours of walking in circles and getting variations on go straight and take your second left, we reached the riad. What a relief! 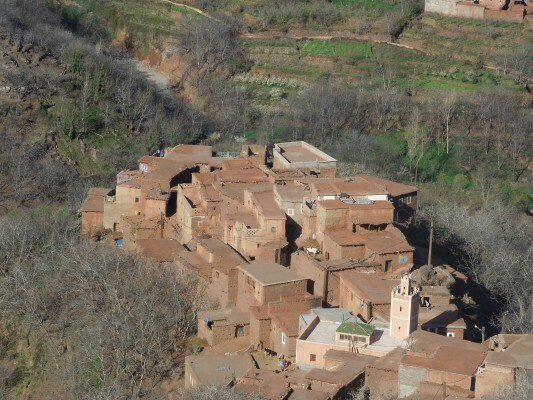 The next day, we were driven to the High Atlas mountain village of Imlil and then hiked with our guide Abdou and a mule carrying our belongings to the Kasbah du Toubkal. What a gorgeous place it is, situated with snow-covered Mount Toubkal, the highest mountain in North Africa, as its backdrop. 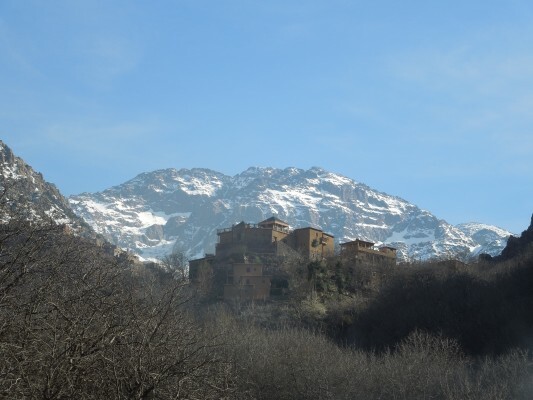 After a warm-up hike to and through the picturesque neighboring village of Armad, we drank “Berber whiskey” (mint tea) on the rooftop terrace of the Kasbah, watching the sun soften on Mount Toubkal, and then took a steam bath in the hammam. It was heaven. Another day, we hiked to a saddle above the town of Tamatert, where we had a commanding view of the Imlil and Imnan valleys and were treated to a delicious picnic lunch at an elevation of 2,480 meters. The mountains are steep, the color of cumin, a spice often used in Moroccan cooking. The architecture is stark, the simple buildings painted in muted browns and pinks. The combination is utterly compelling. 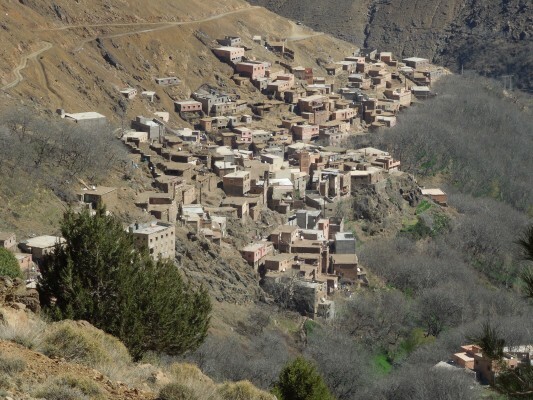 Next, we trekked more than sixteen kilometers with a great deal of elevation changes from Imlil to our destination for the next two nights, the village of Ait Id Issa in the Azzaden Valley, a considerably less touristed place where life is much harsher, our lodging very rustic. Electricity came to this valley in 2006. Outside our window we hear barking, bleating, braying, mooing, crowing, chirping, and the Muslim call to prayer. 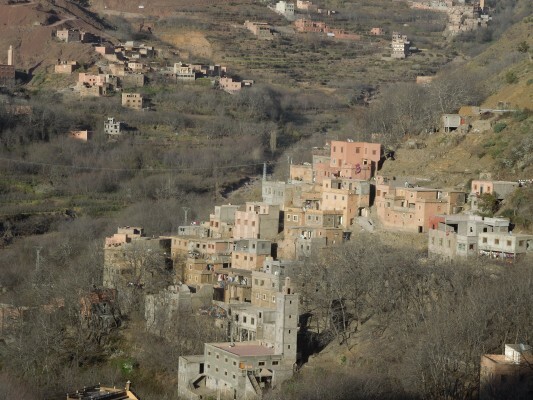 On our fourth day in the mountains, Abdou took us through five of the villages in this valley. The houses are carved into the steep hillsides, built of the earthen material on which they sit, shades of red, brown, and grey. The highlight of the day was a visit to the home of Abdou’s cousin who welcomed us with a meal of home-baked bread, home-churned butter, freshly laid eggs (cooked, of course! ), and Berber whiskey. It was most interesting to be invited into a typical Berber home and experience such warm hospitality! Our final day in the High Atlas Mountains began with a trek straight up from our lodge to the Tizi Oudit Pass. We descended into the Matat Vallley and enjoyed a leisurely lunch along a gently flowing river. We were sad to leave these breathtakingly beautiful peaks after such an extraordinary visit. What fantastic experiences for you both. It’s great hearing about your trip. Sounds beautiful! This sounds like an especially awesome trip! And you describe it so beautifully. Best to Juliet and have a wonderful rest of your trip.